My daugher has a friend that I had promised to make a skirt for but I've been dithering about it for bit. I don't think the girl the skirt is for has ever worn pants. She's usually a vision of tulle and tiara. Sort of intimidating to make something for and actually have her wear it, especially since my attempts at the princess clothes haven't gone over well with the under five set. I'm more of a recon the punk gig tee to a girl's dress and call it a day. So, I dropped the second ruffle and added a wide hem, sewing in a layer of organza and ruffling some 2 meters long of tulle. what you think? Bad move making little skirts in October in Canda? 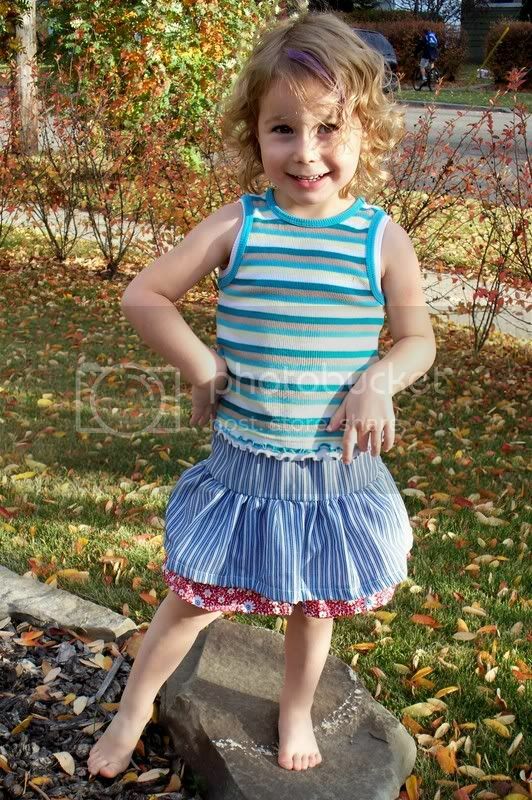 I think it is really cute but what do I know my daughter is still telling me she doesn't wear maked clothes and refuses to even try on anything I make her. But I have to agree with the skirts in October in Canada thing it is starting to get a little nippy up here, have to get some thick leggings and long sleeved shirts. Adorable! 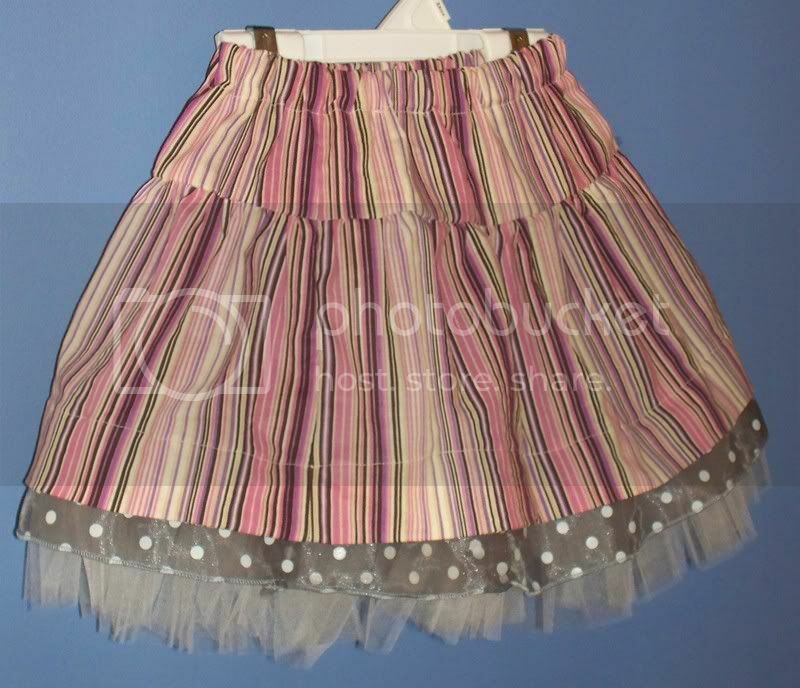 That's a more refined version of the princess skirt. I have a couple of girly-girls who would love that!! Did you attach the organza and tulle just at the hemline or did you bring it all the way up to where you would have attached the second ruffle in the Grand Revival tute? Any tips for sewing organza? I've done it before and it was AWFUL!! Kitchycoo, I use my serger to gather... it's so easy its evil. I don't mind sewing organza, but I tend to miss it when hemming. I do mind the little hairs it sheds... nasty if you breath them in. I attached everything onto the hem, which was actually a seperate piece about 1 1/2" wide. 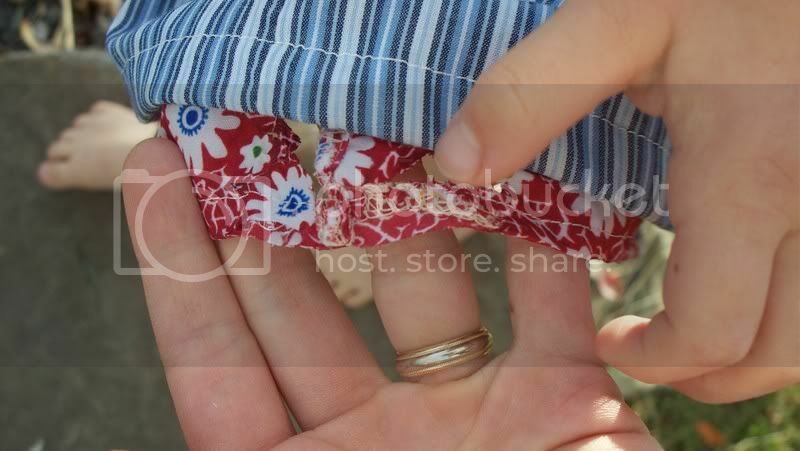 It's sewn onto the top of the hem so it appears that it is actually full skirts underneath (in theory). I love the first one but it is really hard not to like something worn by such a cute model. I love this! Someday I'll have a serger... but I suppose I can add the ruffles and fluff the old fashioned way with my pfaff.